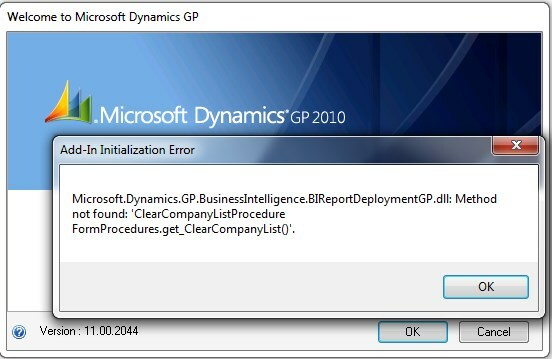 When in REPORTS>>Template Maintenance, after creating a new report from an original report, clicking on “Modify” caused a file not found exception on our install of GP. 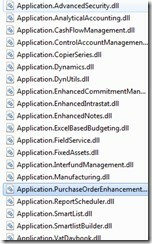 "File Not Found: C:\DOCUME~1\USERXX\LOCAL~1\TEMP\file you were savingcreating.docx"
These solutions were not working for us. Between us we spent too much time running filemon and looking at debugger tool traces trying to track the problem down. 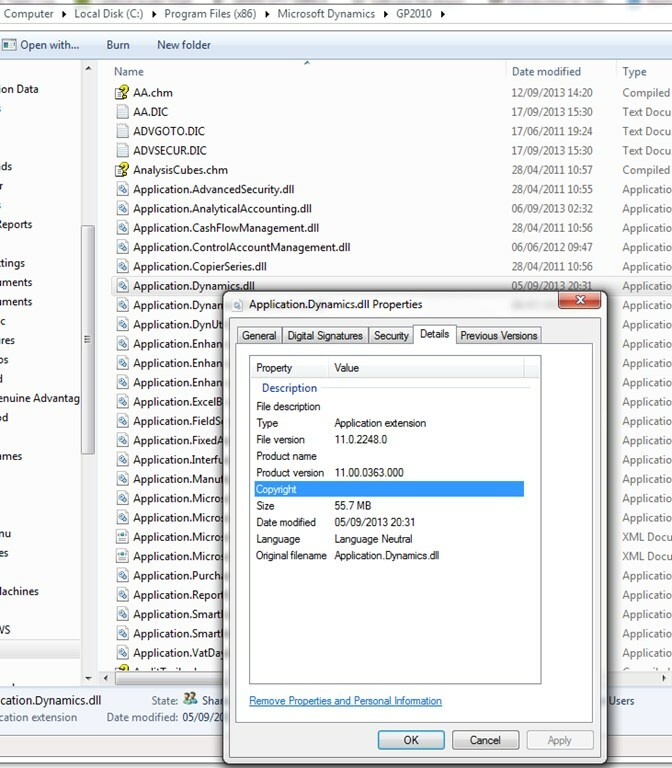 The traces showed the template being created in the user profile temp directory with no error, but in reality it never got there. The server copy did work correctly. We spent some time between us trying to work out what the issue was and finally a colleague said something that made sense to me, so I checked out the theory. 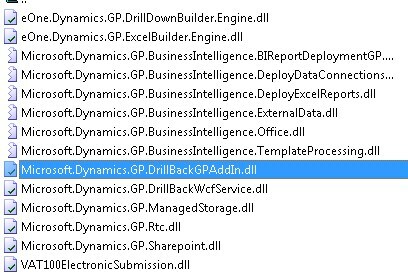 After copying all but the BusinessIntelligence dlls to the add-in folder of the previously broken install, the feature started working correctly again. 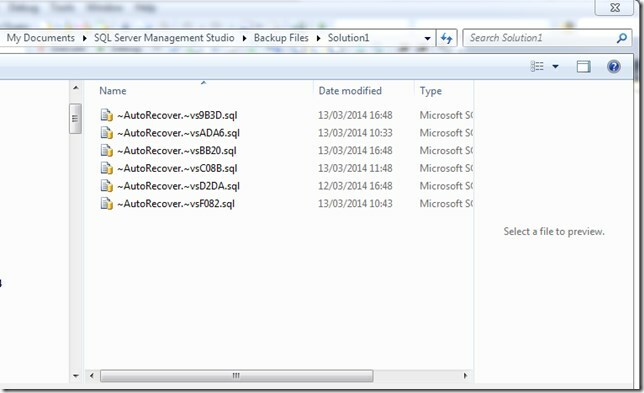 My guess is the managed storage dll is involved with the creating of the temp file… possibly. 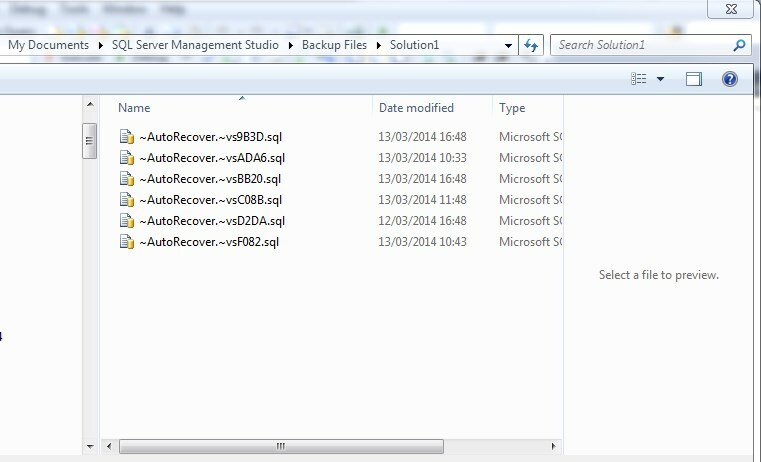 Hence it would seem we’ve dropped these files as we have upgraded through the versions. 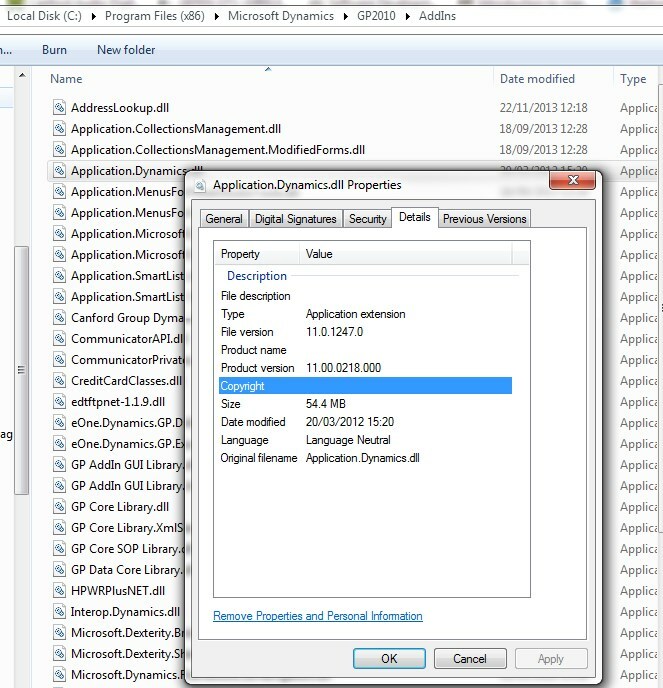 We have our own Visual Studio Tools Addins in the add-ins folder. 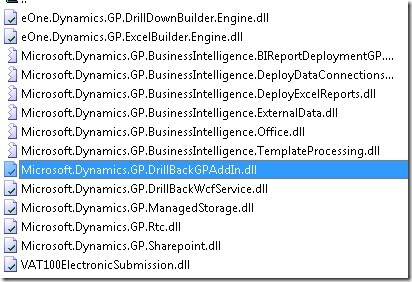 These are passed from version to version as we upgrade GP. 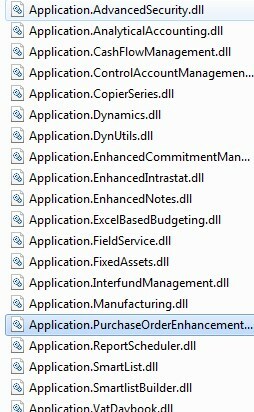 My guess is these extra missing dlls got lost at some point causing the word template editing functionality to fail. I hope this post has helped you get to the solution more quickly that we did. The Tax Registration number validation implementation looks to be flawed. Every EC country has VAT number formats they use, and regular expressions can be derived for most of them. 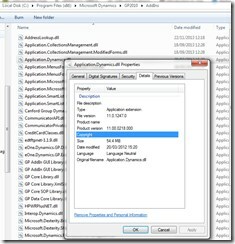 Be aware that they are dynamic formats, regularly (well relatively) validation changes. 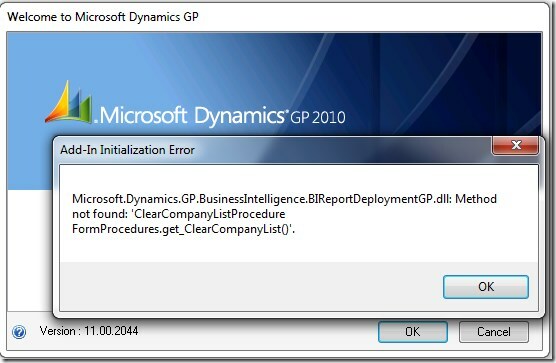 As Microsoft Dynamics GP users this catches us out when it happens between releases as we need to wait for a hot fix. At my company we have a SQL table of regular expressions against ISO country code, that we maintain for our website to validate the tax registration number formats entered by users. It is surprising how often we end up tweaking them, for new ISO country codes, a country changing a format, a country joining the EC etc. However when we get to GP this is very painful. 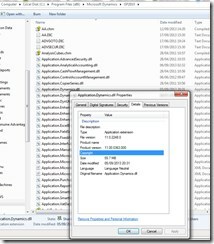 I understand that in Dynamics AX, there is a user setup form where you can play with the the validator format for each country code. In GP we don’t seem to have this. From what I can tell whatever validation is occurring, the rules do not even reside in a table. It looks like it is complied into the app code! I remember the same issue with valid Belgium VAT numbers not being accepted a while back, a hot fix followed to fix it that time. So today a customer presented, a newly created Irish company that uses the new Irish VAT number that now permits two letters at the end (e.g. 123456SH), this is a new format we’d not seen before and GP baulked at it with the familiar “Invalid Format” validation error on trying to enter it. 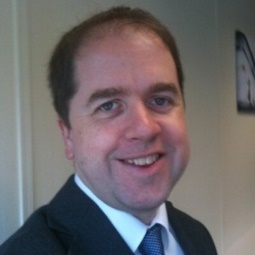 First the sales staff checked with the VIES online checker see my GP implementation of this here, Dynamics GP real time EU tax registration number validation using VIESit validated fine. Checking with the VAT number format on the “.gov” website EU country codes, VAT numbers and VAT in other languages, it seems it is indeed valid. So we updated our website table, checked for any other country changes and then were left with no way to make GP take the number (other than direct to SQL). Time to raise a support ticket with our partner. I guess I’m saying that the country code setup window should have the ability to enter a regex (for advanced users), to allow us to intervene when these formats change, without the serious expense and time of having to test and deploy hot fixes. Obviously I’d expect the regex to come out in a table in SQL somewhere in that scenario.